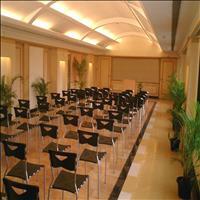 Best Time to Visit: October to May and June to September to enjoy the monsoons. Goa..., a tiny emerald land on the west coast of India situated between the borders of Maharastra and Karnataka, is better known to the world at large as the former Portuguese enclave on the Indian soil. With the rule of the Portuguese for over 450 years and the consequential influence of the Latin culture, Goa presents a somewhat different picture to the foreign visitor than any other part of the country. Not only the proportion of Christians (almost all of whom are Catholics) in the total population of Goa much higher than that obtaining in most of the other States; the general way of living is also markedly different. Western influence is evident in the dress and food habits, and the general life of the people is quiet and peaceful. 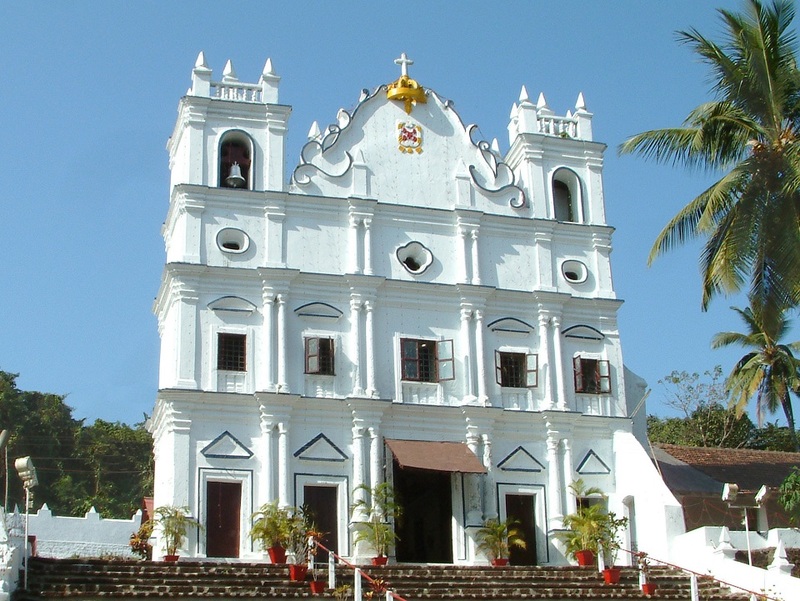 A striking feature of Goa is the harmonious relationship between the two principal religious communities, the Hindus and the Catholics, who have lived together peacefully for generations. Golden beaches, fairy tale mansions and churches, wonderful food, friendly people and of course, feni, these are just the few things that Goa is thought about. There is much more to Goa than one can even think of. The 25th Indian state which was merged with the union 14 years after its independence, Goa is a magnificent hybrid of oriental and European culture set in a tropical landscape in India. There are many fragrances to this exotic land and its charm lies essentially in the fact that it’s possible for every tourist to find exactly what he is looking for in this little haven. 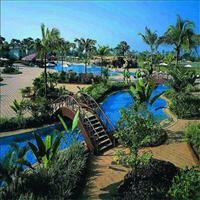 A holiday destination in India for all, in every season. Having been the meeting point of races, religions and cultures of East and West over the centuries, Goa has a multi-hued and distinctive lifestyle quite different from the rest of India. Hindu and Catholic communities make up almost the entire population with minority representation of Muslims and other religions. Be it forts, beaches, mountains, religious places, wild life, water sports, heritage sites… you name it and Goa will provide it with the unmatched hospitality of the Goans. The fun loving people of Goa are living in harmony for past five centuries with their own religions but one distinct culture called GOA. 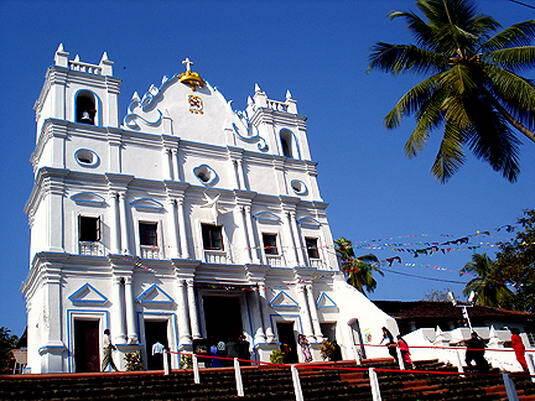 Scattered paddy fields with small fishing villages having temples and Churches, Goa has maintained its sanctity despite the great commercialization it has faced in recent years. Besides the natural beauty, the fabulous beaches and sunshine, travellers to Goa love the laid-back, peaceful, warm and friendly nature of the Goan people. After all, more than anywhere else on planet earth, this is a place where people really know how to relax. The people are welcoming the food is delicious and the wines are good, the exotic and the intoxicating locations are topping on the cake! 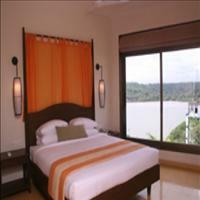 Goa or Gomantak as it is commonly known has been mentioned in the great epic Mahabharat. It means a fertile land. The most famous legend associated with Goa, is that of the mythical sage Parashuram (the sixth incarnation of Lord Vishnu), who several thousand years ago created the entire stretch of Konkan coast by ordering the seas to recede. The first wave of Brahmins to settle in Goa, were called Saraswats because of their origins from the banks of the River Saraswati, an ancient river that existed in Vedic times. A group of ninety-six families, known today as Gaud Saraswats, settled along the Konkan coast around 1000 BC. 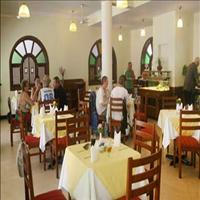 Goan history dates back to antiquity. Rock carvings and rock engravings founds at various places in Goa, indicate that Stone Age people had settled in this ancient land around 10000 - 8000 BC. During the Sumerian era around 2200 BC. Goa has been mentioned as Gubio. Excavations conducted have unearthed many copper coins and plates and temple inscriptions throwing light on the history of Goa. It also has mention in the Mauryan empire of Ashok. Goa was a part of the Mauryan Empire, around third century BC. 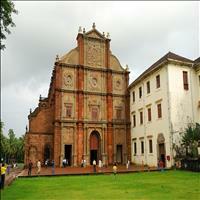 Over the centuries various dynasties have ruled Goa. Rashtrakutas, Satvahanas, Kadambas, Silaharas, Chalukyas, Bahamani Muslims and most famously the Portuguese have been rulers of Goa. The Bahamani Muslims lost out to Vijaynagar and soon everyone realized the importance of Goa as a big trade port. Soon, the Dutch, English, French and Portuguese, all began struggling for its possession. Although Vasco –da – Gama set his foot in India in 1498 A.D. it was in 1510A.D. that the Portuguese could conquer Goa, under the leadership of Alfonso de Albuquerque. The Portuguese rule proved to be the longest, carrying for more than 400 years. 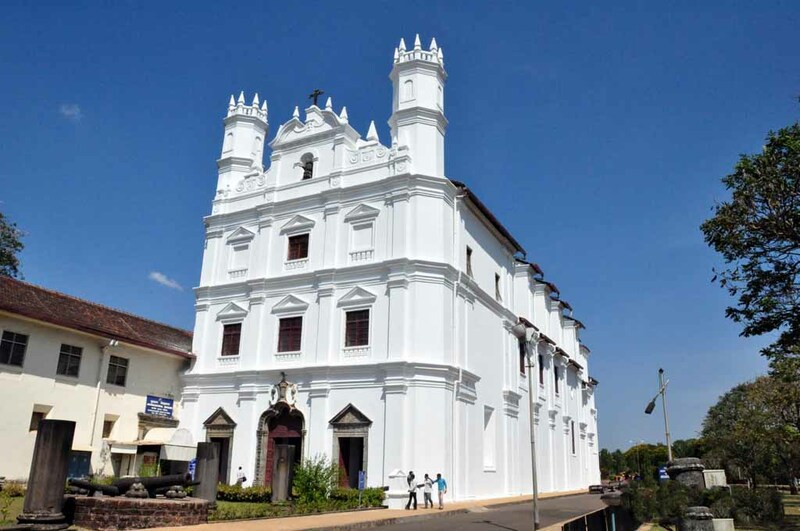 The Portuguese although gave the legacy of beautiful churches and grand buildings to Goa, the people were tormented and tortured and forcefully asked to accept Christianity. But over the centuries the Portuguese became more of Goan than their European origin. Goa was liberated by the Indian Army from Portuguese colonisation on December 19, 1961 and became a Union Territory along with the enclaves of Daman and Diu. On May 30, 1987 Goa was conferred statehood and became the 25th state of the Indian Republic. Panaji (Panjim) is the state capital located on the banks of the Mandovi River and Vasco, Margao, Mapusa and Ponda are the other major towns. 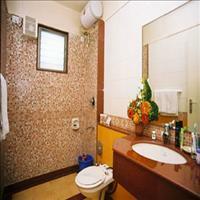 Goa has become the melting pot of various cultures and religions. The Roman Catholics and the Hindus have lived in perfect harmony, sharing each others’ festivals and fairs. All the communities have mutual respect towards one another and have a secular outlook. The people of Goa are fun loving happy go lucky natured people. The nature around and the fertile land has given them a relaxed nature. 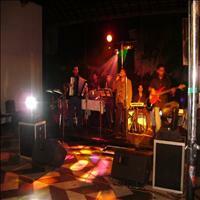 Music, food, festivals and fun is what the Goans are. Fishing and coconut growing along with rice, mango and cashew nut are the main products of Goan farmers. Staple food is rice and fish and coconut is the main ingredient. 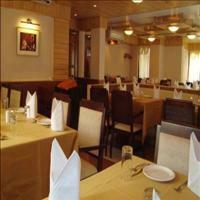 The Christian cuisine of Goa still retains the strong influence of Portuguese cuisine over it. 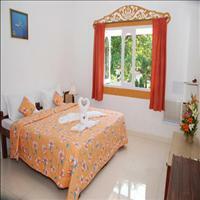 Thus for decades, Goa has been a fascinating destination for foreign and local tourists equally. 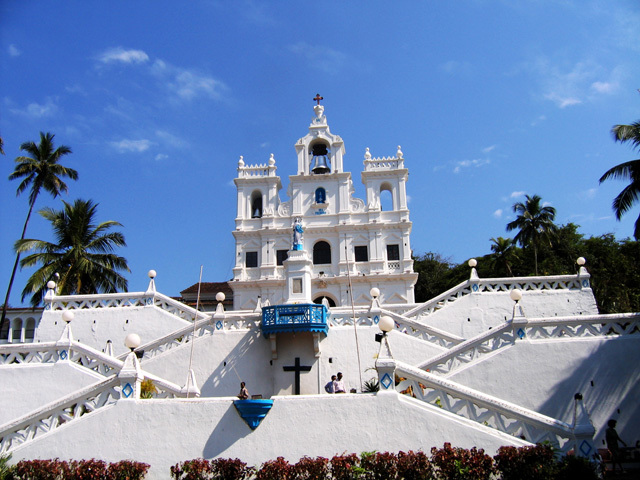 The ancient churches, the temples full of flowers giving out the fragrance, the unique Portuguese ambience, the cool breeze from the sea with its beaches and great people, Goa has lured many and still is the hottest tourist spot in India. 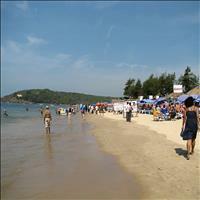 The small state of Goa is in the west coast of the Indian peninsula with a vast coastline of 104 km. An extension to the Konkan coast of Maharashtra, Goa is bounded on the north by Sindhudurg district of Maharashtra state, on the West by the Arabian Sea, on the South by Karwar district of Karnataka state and on the East by Belgaum district of Karnataka state. A place with moderate climate throughout the year, with heavy rainfall in the Monsoon, Goa has gained the name of traveler&apos;&apos;&apos;&apos;s paradise with 365 days on a holiday!! This is the place in India, where weather does not play an important role! The ambience is the climate! 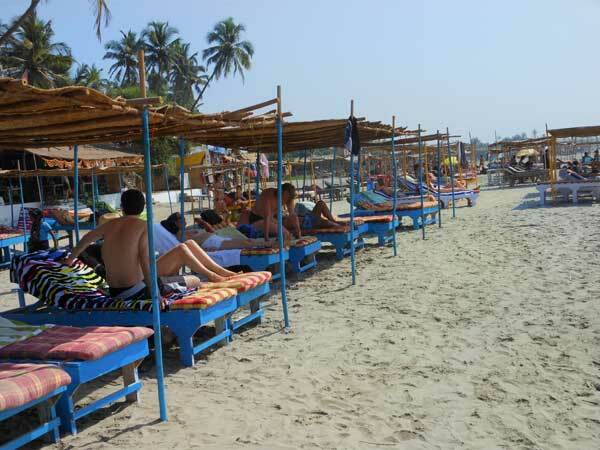 The sultry heat during the months of April and May too do not deter the toursits to flock Goa. 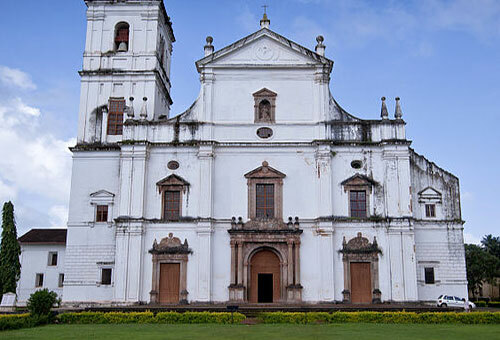 Located in Old Goa, the Bom Jesus Basilica is a World Heritage Monument. 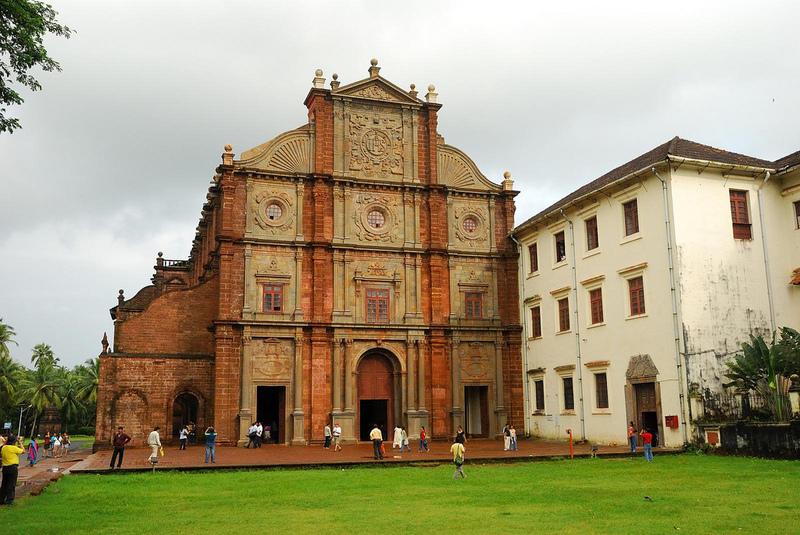 It is the most a, perhaps Goa's most famous church and among the most revered by Christians worldwide. 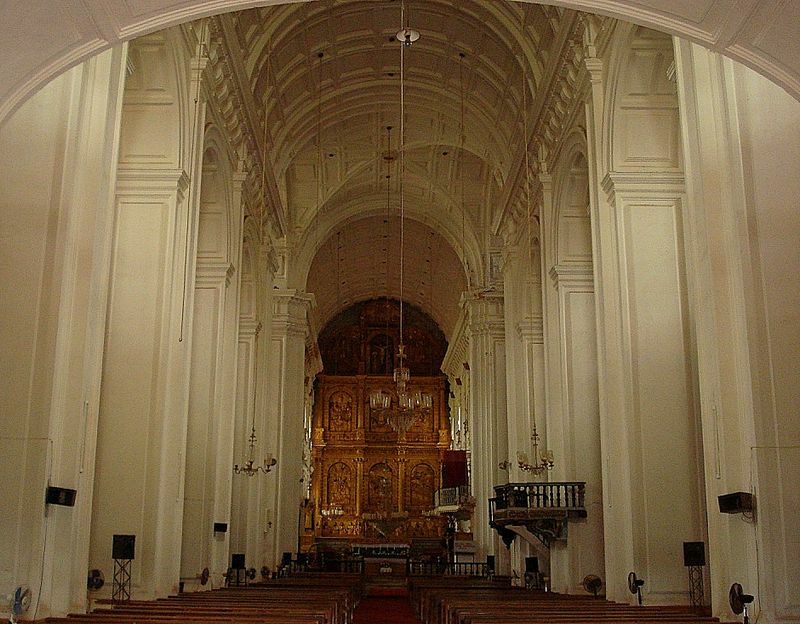 The church built in 1605 A.D. is the only church in Old Goa, which is not plastered on the outside. 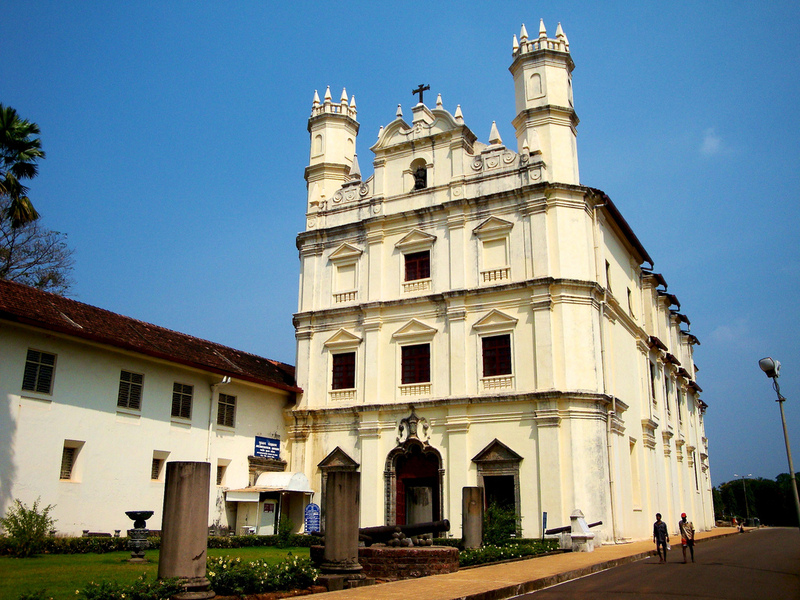 The magnificent edifice stands as a superb example of Baroque architecture in Goa. 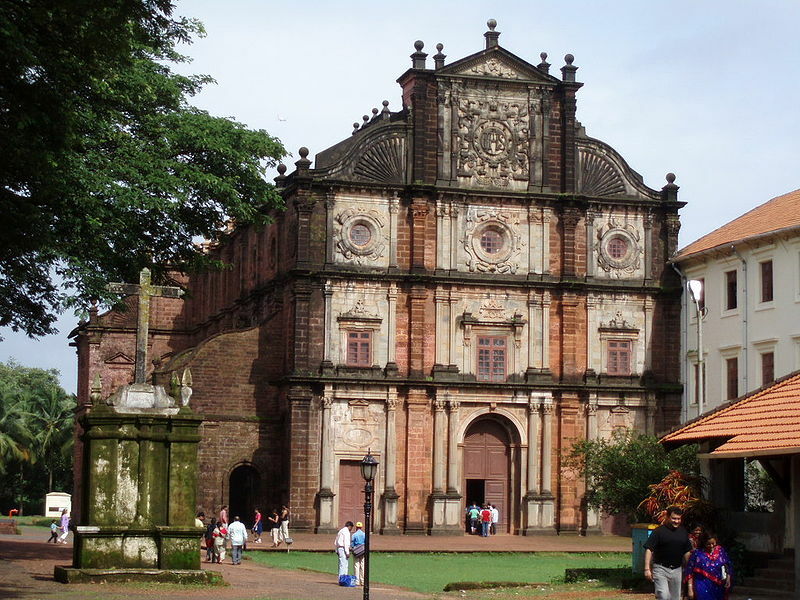 The church is called Bom Jesus meaning good or infant Jesus to whom it is dedicated. The imposing facade, though very simple, is built out of black granite in an exquisite combination of the Doric, Corinthian and composite styles. The interior of the church is built in Mosaico-Corinthian style and is remarkable for its charming simplicity. The body of St Francis Xavier lies in a silver casket in the Church of Bom Jesus. There are many legends regarding the body of the great saint. The body has not decomposed for centuries now and earlier it would be kept out for the people to worship it every ten years. Also that the body has healing powers and can cure any illness is believed by the people of Goa. One of the oldest Churches of Goa, this church was built on the holy hill of Old Goa in 1550. The Church represents a fusion of European and Indian elements; while the wall frescos reveal Hindu designs, those on the alabaster tomb of Dona Catherine, the first Portuguese woman demonstrate the impact of the Muslim-Bijapur style. Built of laterite and plastered with lime mortar, it has a two-storied portico. The roof of the church is tiled, supported by wooden rafters and a wooden cross over it. 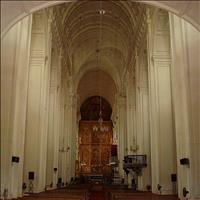 The exteriors of the church are Manuline in style though Gothic influence can be seen in the rib-vault at the portico. 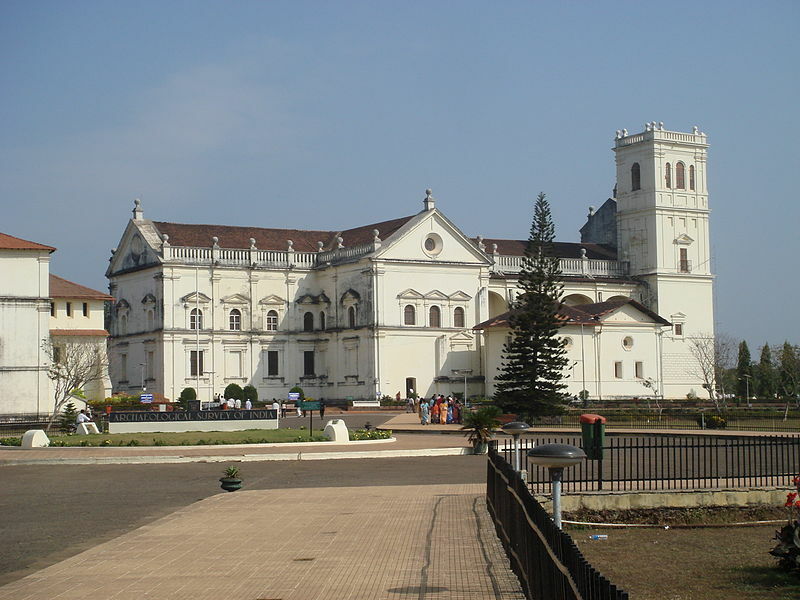 One of the most ancient and celebrated religious buildings of Goa, this magnificent 16th century monument to the Roman Catholic rule in Goa under the Portuguese is the largest church in Asia. The most imposing of all churches, the Se Cathedral overwhelms the visitor with its grandeur and awesome presence. 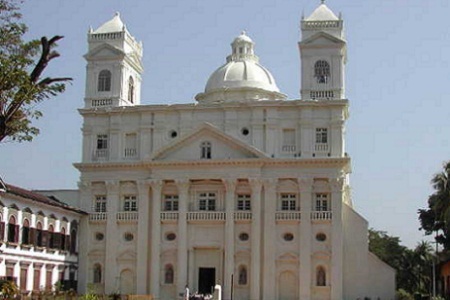 Dedicated to St Catherine, the cathedral, close to the Bom Jesus Basilica, has five bells. One of the bells is called the Golden Bell, due to the sweet sound it produces. The final edifice of this magnificent building is bigger than any of the churches in Portugal itself. The building is Portuguese-Gothic in style with a Tuscan exterior and Corinthian interior. The main altar is dedicated to St. Catherine of Alexandria, and old paintings on either side of it depict scenes from her life and martyrdom. The adjoining convent has been turned in to an Archeological Museum and is open to the public. Built in 1602, the only ruin of the Church of St. Augustine on the Holy Hill at Old Goa near the Nunnery, is a lofty 46-metre high tower defying the torrential rains. The tower is one of the four of St. Augustine Churches that once stood there. This highly visible landmark, the high tower served as a belfry and formed part of the facade of a magnificent Church. The Tower was meant to serve as a belfry and the Church had eight richly adorned chapels and four altars and a convent with numerous cells attached to it. The church dedicated to Our Lady of Divine Providence, the church is named after the founder of the Theatine order, St. Cajetan, a contemporary of St Francis Xavier. This church, which is said to have been modelled on the original design of the Basilica of St. Peter in Rome, is architecturally Corinthian both externally and internally while the gilded altars with rich carvings are in rich Baroque style. The Church building itself is built of laterite blocks which are lime plastered. Inside a clever use of internal buttresses and four huge pillars has turned the interior into a cruciform. Profusely carved and gilded in Baroque style, the six altars have twisted shafts dominated by figures of angels. The altars also have Italian school paintings on canvas, some depicting scenes from the life of St. Cajetan. 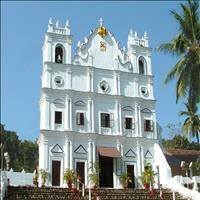 A relatively simple church by the standards of the time is one of the first churches built on the Goan soil. The earlier church, built in 1541 was completely re-built from its foundations in 1619. The main altar dedicated to dedicated to Mary Immaculate is very impressive and also the two flanking altars which catch the eye. Each is a riot of heavily gilded, deeply carved ornamentation, yet compact and controlled, a fine example of the period. At the side of each is a marble statue, one of St Peter and one of St Paul. Goa is an ancient city. Goa has several imposing forts, though most of them lie in ruins today. The forts were built mainly by the Bahamani dynasty and the Portuguese. Most of the forts are not in good conditions due to negligence or the weather conditions. But most of them are near the beaches and worth a visit. 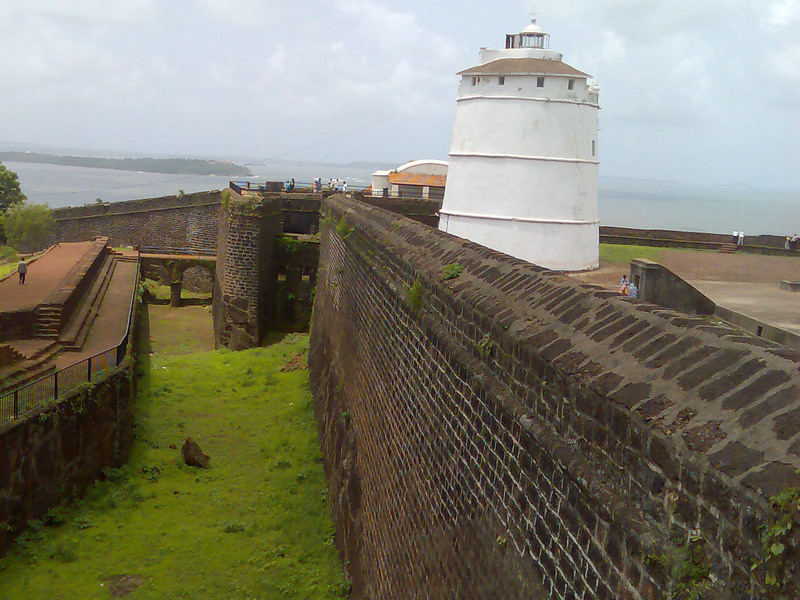 Compared to Indian standards, Goan forts are very small in size. Nonetheless, these are historic specimen of immense military, political and economic importance in a land crisscrossed by rivers and canals and bordered by sea on the west. 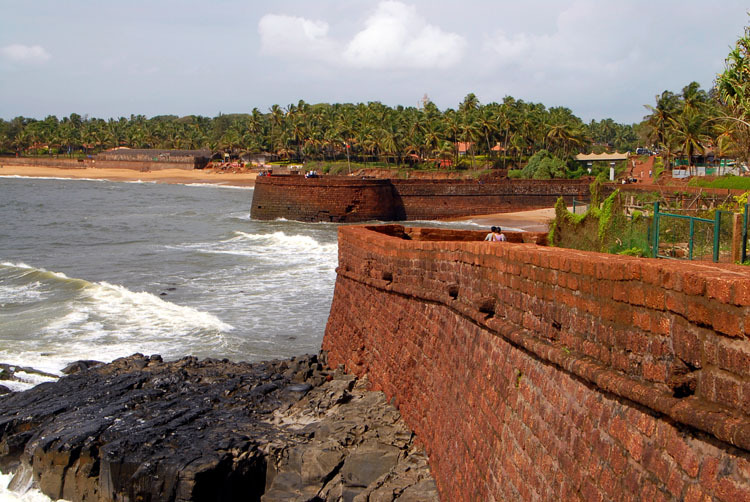 The largest and the only well preserved fort of Goa is the Aguada. Around 15 km from Panaji, in Old Goa, this fort is strategically located at the estuary of the river Mandovi. Built in 1612, to control the entry into the river Mandovi and to protect Old Goa from potential enemy attacks, this fort is the only fort that was not conquered by any invaders during the 450 yearlong rule of the Portuguese empire. The fort acquires its name from the fresh water springs in the area. Agua in Portuguese means water and thus the name Aguada. An interesting feature in the precinct of the fort is a 13 meter high lighthouse. This lighthouse, built in 1864, earlier used oil lamps and was recently renovated in 1976. The Cabo da Rama means cape of Rama fort. Located in the southern part of Goa in Canacona region, this place is believed to be inhabited by Ram, hero of the great epic Ramayana, hence the name Cabo –da Rama. The fortress on this site was held by various rulers for many years, and it was in 1763 that it was gained by the Portuguese from the Raja of Sonda. Until 1955, the bastion housed a prison; now its only habitable building is a lonely government observation post occupied from time to time by a couple of young scientists from the National Institute of Oceanography. Now it just houses old rusty cannons and what else remains on the fort is entirely Portuguese. The fort base on the River Chapora is located 10km from Mapusa, near the Anjuna and the Vagator beaches. This red-laterite bastion was built by the Portuguese in 1617 on the site of an earlier Muslim structure built by the Adil Shah of Bijapur. Intended as a border watch post, it fell to various Hindu raiders during the 17th century, before finally being deserted by the Portuguese in 1892. Although in complete ruins now, this fort offers a grand view of the two nearby beaches. This grand fort on the south headland of river Mandovi and opposite the Aguada fort was built in 1540 A.D.The Palace fortress housed the Franciscan monastery, which later became the official residence of the Governor of Goa. The Cabo Palace is now known as the Raj Bahawan, the official residence of the Governors of the States in India. 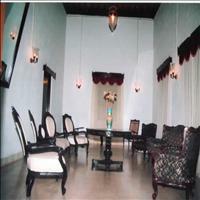 It is also counted among the finest residences of Indian Governors and is indeed the oldest residence of a Governor of a State in India as its origins date back to over four hundred years. 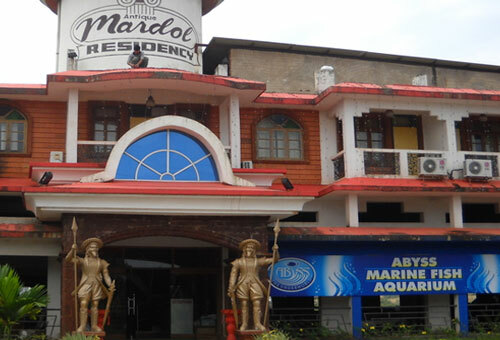 Today it offers a beautiful view with the Indian Ocean towards the west, the Bay of the river Mandovi and Fort Aguada on the north and the busy port of Mormugao in the south. This ancient temple built in the 12th century by the Kadamba dynasty is dedicated to Lord Shiva. Approximately 65 km from Panaji in a small village of Tambi Surla the temple has survived the Muslim and Portuguese invasions because of its remote placement. 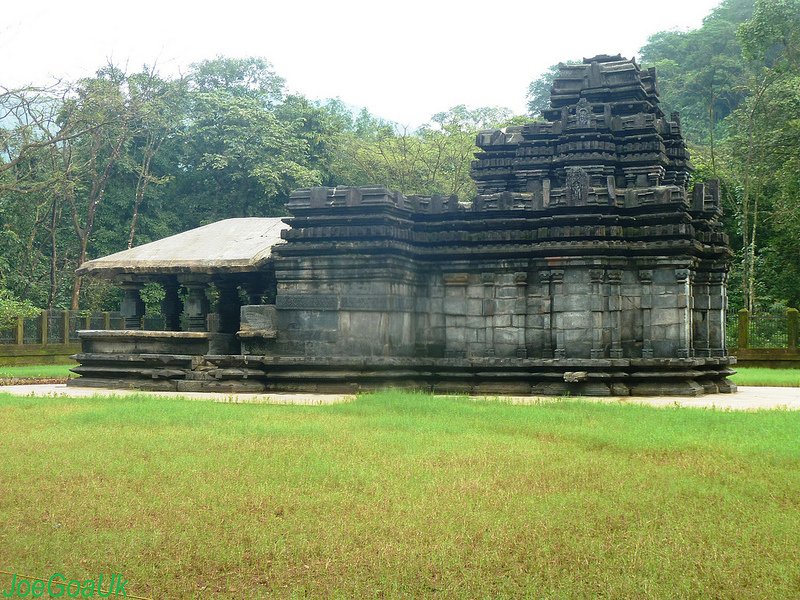 Built in Jain style, the temple is considered to be the only specimen of Kadamba-Yadava architecture in basalt stone preserved and available in Goa. The size of the temple is quite small as compared to the size of the average Goan temple and the top part of the temple has never been completed. 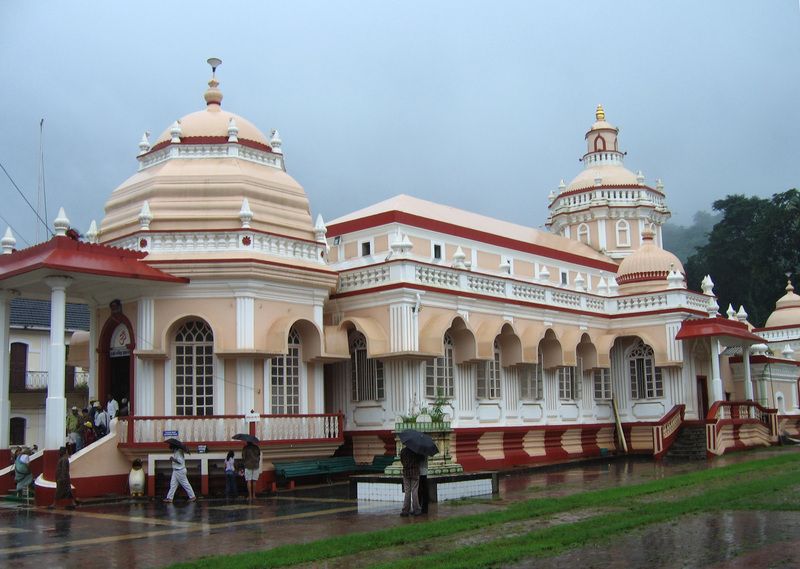 The temple is located at the foot of the Anmod Ghat, which connects Goa to the state of Karnataka. It is a small, beautifully carved and perfectly proportioned black basalt temple with Lord Shiva in the Lingam form. 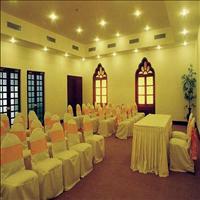 The intricate carvings created by the craftsmen adorn the interior and the sides of the building. The temple faces east so that the rays of the rising sun fall on the deity at the crack of dawn. Bas-relief figures of Lord Shiva, Lord Vishnu and Lord Brahma, with their respective consorts appear on panels at the sides of the temple. 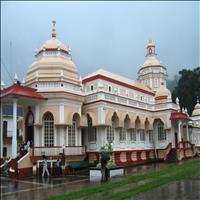 Probably the most famous of all the temples in Goa is the Mangesh temple. Located 21 km from Panaji in Priol, the temple is nearly 500 years old and is dedicated to Lord Shiva in the form of Shiva Lingam. The shifting of the deity took place in the year 1560, fearing the Portuguese inquisition and was placed here. The surrounding area is known as Mangeshi due to the temple. The temple architecture is a mix of Hindu, Christian and Muslim influences and is lit up in magnificent lights during the annual Jatra which is held in January. The Miramar, The Dona Paula, The Calangute, Anjuna Beach and the Sinquerim beach. The Northern beaches of Goa start just outside Panaji, from the Aguada Fort and the sand stretches to the borders of Maharashtra. 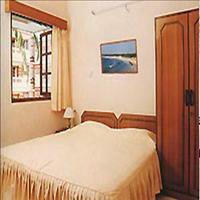 The Miramar Beach is very beautiful and equally commercialized beach of Goa. 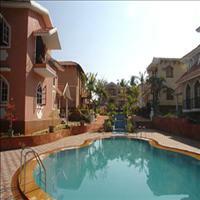 Its proximity to the capital, just 3km from Panaji, has made many big hotels and rich people’s bungalows stand here. This beautiful beach lies adjoining the estuary of the river Mandovi as it opens into the Arabian Sea and was originally known as the Gasper Dias Beach. From the beach across the river is an excellent view of Aguada Fort. Popularly known as the Lovers’ Paradise, the Dona Paula Beach is a rocky hammer shaped headland where Goa’s two rivers Mandovi and Zuari meet the Arabian Sea. There is a myth attached to this beach. 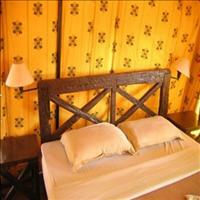 It is named after the Viceroy’s daughter Dona Paula de Menezes, who fell in love with a local fisherman. When her family did not give consent for heir marriage she jumped off the cliff. Her ghost still haunts the place, it is said. The beach is beautiful and has some facilities of water sports as well. 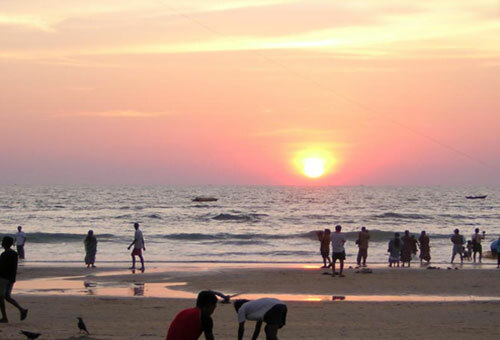 The Calangute Beach is known as the queen of beaches. Just 15 km from Panaji, this is the most famous and thus most commercialized beach in Goa. This huge seven km stretch of sand is therefore always overcrowded. 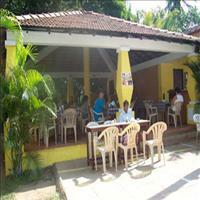 The village of Calangute is well equipped with all the amenities a tourist might need. About 18kms from Panaji is the village of Anjuna, a five square mile enclosure nestling between the Arabian Sea and the Hill, overlooking the Anjuna Beach. The beach is known for its swaying palms, soft sands and has an unusual rocky formation overlying a cove of white sand and black rock that juts into the Sea. There is more to Anjuna than the beach and that is the Flea Market that takes place here every Wednesday. Earlier, a hideout of the hippies, this market was started by them when their pockets were empty. The hippies started selling everything they had and thus began the market, which is now flooded with artisans from all over India. 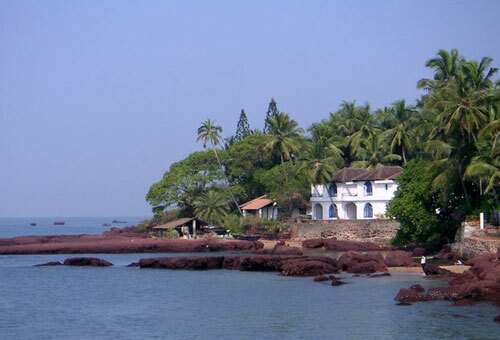 The Sinquerim Beach is located some 13 km from Panaji. With a magnificent 17th century fort which has now been converted into a prison. It is one of the best beaches in Goa with international class facilities for water-skiing, para-sailing, fishing, scuba-diving and wind-surfing. 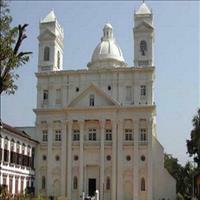 Constructed in 1555 on banks of the Mandovi River, in Panaji, the church is dedicated to three Magi Kings. It was once the residence of top dignitaries and also a mission centre of the Franciscan order. This fine historical monument was also dedicated to St Jerome. The small hamlet of Reis Magos has rich colourful and impressive interiors with the highlight being the multi-coloured wood relief showing the three wise men (Reis Magos) bearing gifts to the baby Jesus, which is the centerpiece of the elaborately carved and painted reredos behind the high altar. Every year on the 6th of January, Reis Magos comes alive with the colourful Festival of Reis Magos, when the story of the three Kings is re-enacted by local youth playing the parts. 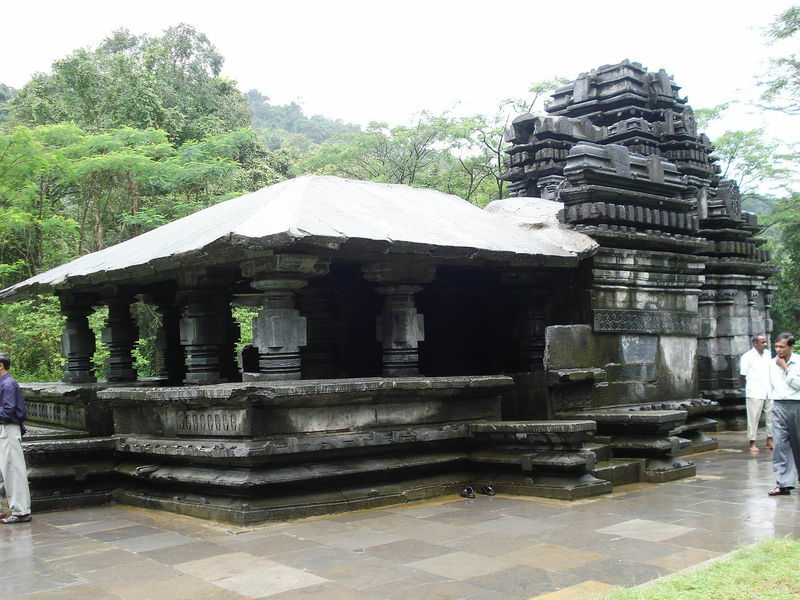 Set amidst tranquil forests and hills, the Shantadurga Temple lies 3-km from Ponda in Queula. Shantadurga, one of the consorts of Shiva, is a form of Durga (the Goddess of War) and the Goddess of Peace. 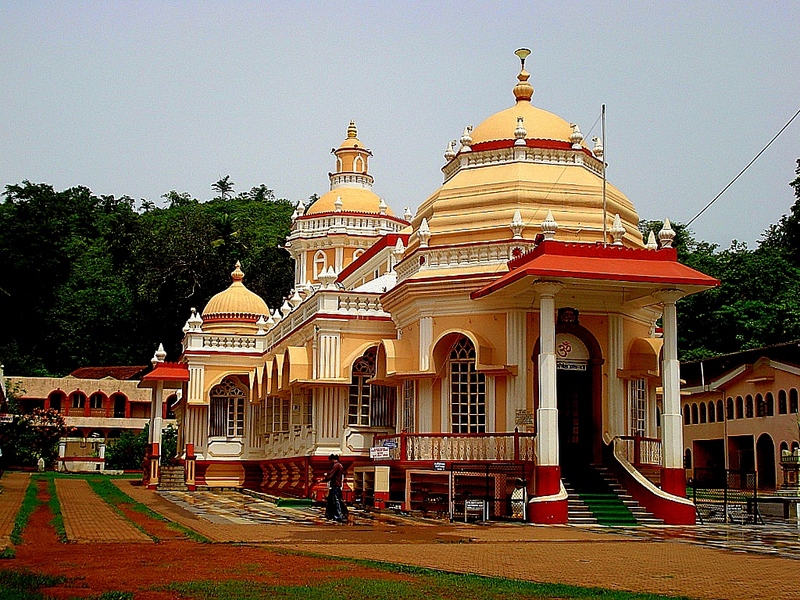 The Shantadurga Temple was built in 1738, and is the biggest temple in Goa. A distinctive six-storied Deepstambha and chariot with some gilt work adorn the temple grounds. It is interesting to note that amongst some other features of the temple, the dome shows a definite influence of Church architecture. As the Goddess of peace she is placed between the temples of the Destroyer, Lord Shiva and the preserver, Lord Vishnu’s temples. The Benaulim beach, The Majorda, The Colva beach, The Agonda and The Palolem beach. 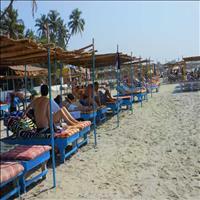 The Southern Goa beaches start from the Majorda Beach near Margaon and extend till the southern tip of Cabo da Rama of Goa. Nearly 35 km south of Panaji is the Majorda Beach. There are many hotels on the coastline. The Majordans are supposed to be the best bakers in Goa and also are famous for the local liquor toddy. 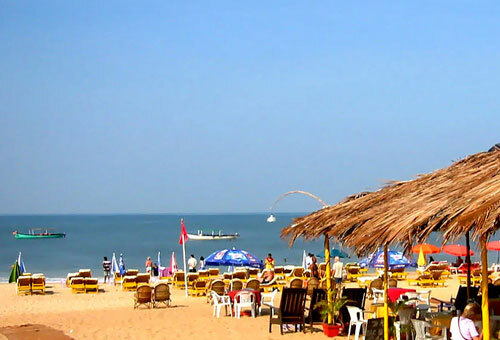 Colva Beach is the most important beach in the southern circuit. About 39 km away from Panaji, Colva is the most loved beach of Goans. Colva is a 20 km of virgin white sands, palm fringed, and sun drenched beaches and is also equipped with all modern amenities. The Church of Our Lady Of Mercy inside the small village is famous for its miracle statue of Menino Jesus. This is a fishing village and one can seethe motorboats venturing into the sea for a catch or Mackerel being dried in the Sun on the sand. Less than 2 km south of Colva is the more tranquil Beach of Benaulim. Benaulim is actually the place where the legendary arrow of Parshuram landed, asking the Sea to recede and make a place for people to stay. Although a fishing beach, Benaulim is peaceful and serene and undiscovered by the commercialization going around. It is one of the few places in Goa where one can glimpse handicrafts typical to this area. The best of the traditional rosewood furniture is made here. The Agonda Beach is a three-kilometer long beautiful cove of white sand, safely secluded in the palms but a bit far from the capital of Panaji. But it is an ideal spot for those who would just want to be nature. There are no tourists, no souvenir stalls, and no restaurants, nothing on this beach. Just the calm and serene beauty of nature. One can get adventurous by camping on the beach in the night listening to the crashing waves and watching the moonlit ocean. 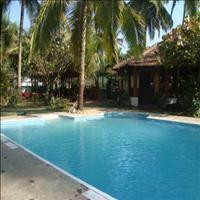 Nearby is the almost virgin Cabo de Rama, a must visit. On the southern tip of Goa, nearly 70 km from Panaji, is the beautiful silver san beach facing the blue bay, the Palolem Beach. There are beautiful beach huts for a stay and shack for snacks. The fishermen in the area take the tourists to spot the dolphins in the sea. 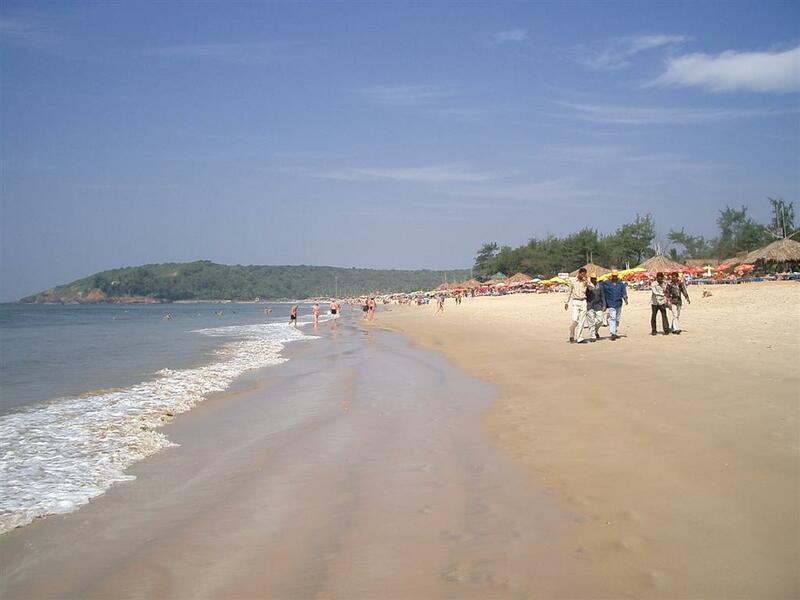 Other than these beaches there are many more beaches in Goa, if one likes to venture. Varca, Cavelossim, Mobor, Bogmalo, Candolim, Baga, Vagator and so on. The list is endless. This handpicked special tour takes you on beautiful hill stations, sun kissed sandy beaches and exotic wildlife destinations. Take a trip through ‘God’s Own Country’, Kerala that has earned its name from its pristine white beaches, coconut trees, and mouth watering culinary delights. There is also the added advantage of exotic destination of Goa considered to be a tourist paradise with its colonial ambience, tropical beaches and Portuguese heritage.